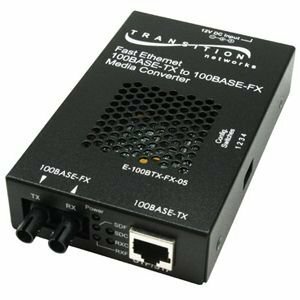 Transition Networks 100BASE-TX to 100BASE-FX Media Converter makes cost-effective integration of twisted pair and fiber optics in Fast Ethernet networks easier than ever before. Used in pairs, this media converter can extend distances between two twisted pair switches or a switch and a server up to 2, 000 meters over multimode fiber, or up to 120, 000 meters over single mode fiber. Using one media converter, a switch with a copper port can be connected to a switch with an existing fiber interface.